JONATHAN "iNTREPiD" Sypert always knew his true calling was to perform in front of others. Both his parents were musicians. Sypert's mother, who raised him as a single mother in Hawaii after a career on Broadway and a stint as a singer at the Grand Ole Opry, even used a random discovery 20 years ago to positively influence her son. "So at 10 (years old), I started dancing." Over the years, Hawaii residents have seen the UH Lab School graduate on stage in various Oahu theater productions, in classrooms at the Movement Center and on television. This weekend, he'll introduce another facet of his artistic abilities with the release of "Dreamcatcher," a 10-track labor of love he produced on his own record label, SoulKitchen Records. SYPERT SEES the album as an opportunity to connect with others who are tired of the violent content and explicit language that permeates rap music today. "(The songs) on the radio get real trashy," he said. "Part of my mission is to be part of the positive hip-hop scene. ... I made it a point to make sure all my lyrics are clean." Just a few years ago, however, Sypert's attitude would have been completely different. He was living like a rock star without concern for the consequences. 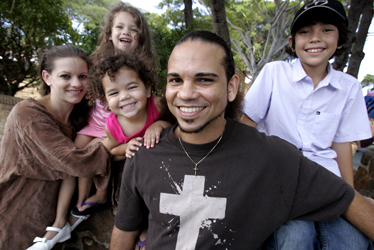 Sypert dropped out of college in 2001, after taking classes for six years at the University of Hawaii-Manoa. And although he was teaching dance with his mother and working as a company actor at Honolulu Theatre for Youth, his lifestyle choices were becoming more and more dangerous. "It was everything," said Sypert. "Drinking, women, living the fast life without the means to do it. I drank my way out of UH. "Honestly, it wasn't until I found my wife that things began to come into focus." With his wife, Nani Elm Sypert, came a closer relationship with God. "My wife and I are going to celebrate our one-year anniversary in July, and we've been together for four years," Sypert said. "And we have a 2- 1/2-year-old daughter together, and two kids that are from her previous marriage. "It's not textbook, what you learn in sociology class, you know, how you're supposed to raise a family. It's not traditional. The only way I can make any sense of it is the fact that I had to get real with myself, and I got real with God and gave everything over to him." BUT JUST because he talks (and raps) about God, and is holding his CD release party in conjunction with a fundraiser for a youth group at Central Union Church, don't categorize Sypert as just another crusader for Christ. "I'm not here to convert anybody," he said. "But if someone wants to have a discussion, I'm willing to listen and I'm willing to share. "What I'm trying to do with this album is to provide more positive music. I happen to talk about God from my perspective as a person, through my life experiences, but this is not a praise album." By establishing an independent record label, Sypert says he has the freedom to record the type of music he wants at a pace he's comfortable with. There's nobody to answer to, something that might have been a problem before he became a father of three. Now, Sypert realizes the value in planning and setting priorities. "I'm finally getting around to using my gifts the way I could have utilized them maybe six years ago, or even 10 years ago, if I had applied myself," he said. "It's not about the money or the fame." Giving credit to slam poet Kealoha, former Hawaii resident DJ Lumenz, and veteran recording artist and performer Henry Kapono, Sypert believes his career is back on track and moving in the right direction. He's re-enrolled at UH, with plans to graduate with an art degree in set design. And just as Saturday's party will benefit Central Union's Youth on the Move, he hopes to continue with performances that will raise money for worthy causes. "This concert is basically an example of what I'd like to do for any group that wants to have a fundraiser or bolster whatever they got going on," Sypert said. "I'm down to do anything and everything."